Our students always appreciate the opportunity to meet the representatives from different corporates in different events organized at our premises. The participating organizations can add value and can create worth by sponsoring various events; this in term may give the organization a higher image felt at the institute. We encourage you to participate in as many numbers of activities/events as possible to help you to fasten your recruitment needs. The company can sponsor project work to the students. Our students have taken up live projects with many organizations. Many Indian and international firms have approached our campus for sponsoring there projects and studies which is beneficial to both students and corporates. The companies can link there website to www.bvimr.com . 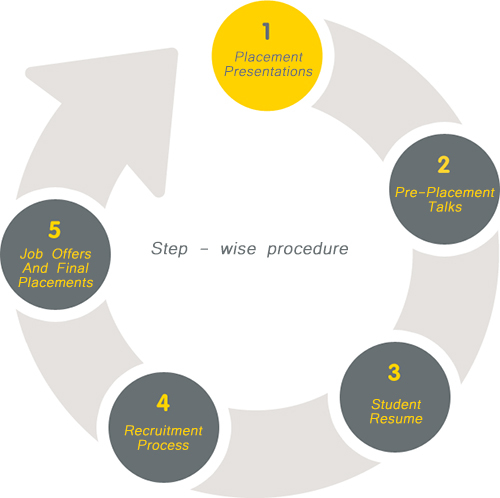 The pre-placement talks is a two way communication process where in the representatives of the organization brief the students about the company profile, the job description, number of exact openings, the career progression, the remuneration offered ----- etc. The PPT usually starts with registering with Training & Placement cell and getting a confirmation from the Placement team for holding the PPT. The registration form for the same can be ordered through the fax, email, snail mail, telephone etc. The CRC l makes the necessary arrangements for the representatives of the organization for their campus visit and interviews. The state of art infrastructure available at the institute is having a facility of guesthouse to accommodate the representatives. The companies can choose the dates as per their convenience for the visit.